Hi, these are some of the butterflies I painted with twinkling H2O's on the weekend. I'm linking up to the challenge at Just Add Ink where they have a colour challenge. I don't have a lot of Stampin Up inks so I hope these colours are close enough. I used a new die that I got a few months ago, just had to have it but hadn't even tried it out yet! It's Lucienne Tile from Memory Box. Darnell over at djkardcreations is celebrating her 600+ followers with an NBUS challenge. To use some of your stash of never before used schtuff! So I'm linking up there too and will probably stay for a while as Darnell's blog is full of witty stories and lots of inspiring cards and techniques. I'm also linking up to the challenge at Addicted to Stamps & More where the theme is to make your mark, using pencils, markers, chalks or paints on your project. I pained my butterflies with a few pots of twinkling H2O paint. Memory Box cocoa bean stamp and lucienne tile die; twinkling H2Os; sentiment sticker. Cathy, this is just delightful! A lovely CAS card with big impact..:0) Thanks for joining us at Just Add Ink. 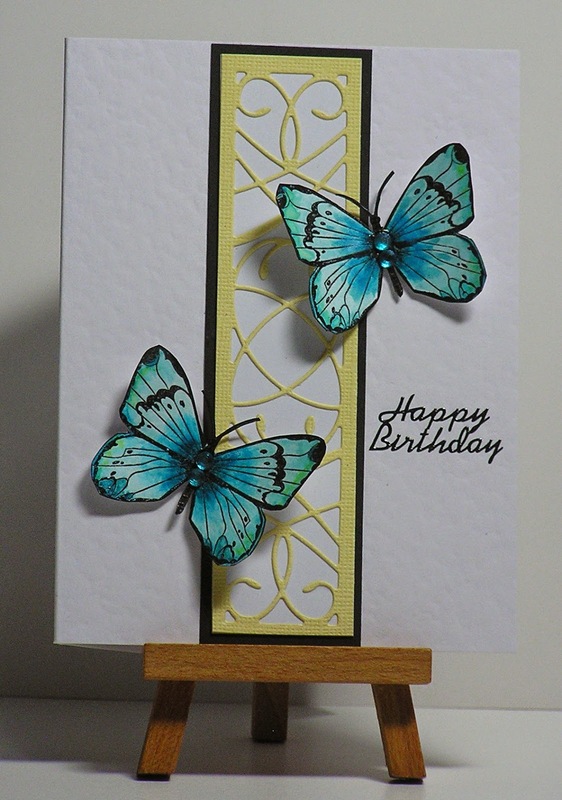 Beautiful coloring on your butterflies and I love how you added the center panel on this card! Thank you so much for playing along with us this week at ATSM! We really enjoy seeing what you create for the challenges! Lovely CAS card Cathy. You've reminded me about H2Os - haven't used them for ages. Beautiful colouring butterfly~ and great catch on the color challenge! Thank you for sharing at ATSM! I love how those gorgeous butterflies are perfectly balanced either side of the central panel, Cathy. Lovely use of colour, too. Thanks for joining us at Just Add Ink this week! Way to use that new die to it's full potential! It looks perfect with those gorgeous butterflies! I love the colors! I love how delicately you have used the colours here Cathy. The swirly die cut and butterflies are a perfect match. Thanks for joining us at Just Add Ink this week. Aren't Twinkling H2Os fun! Your butterflies have me swooning, and placing them on that lovely die cut is such an eye-catching touch! Gorgeous! Thank you for sharing at ATSM! Very pretty die and your butterflies are gorgeous. The little bling adds a sparkly touch! Gorgeous, Cathy! I have this tile die in my NBUS box! I don't think I can come close to this though! Hi Cathy, the panel is so elegant and the colouring on your butterflies is sensational. Fabulous use of the colours. Thank you for joining us at ATSM. Goodness your butterflies look so delicate, you've done a fab job colouring them in!